Building a successful private hire taxi firm from the ground up in today’s competitive market is never easy. But to take over a firm with just a handful of cars and transform it in to the biggest and most reputable firm in the area is the material of dreams for most owners. However, Nick Jones, owner of ABC Travel in Harlow, has achieved just that. He took over at the helm twelve years ago when the firm had a modest fleet of ten vehicles. This was merely a starting point for Nick who, with a little drive and ambition, soon expanded the fleet to thirty. Many could be forgiven for settling for an easy life at this stage and simply coasting along with a business serving its purpose. This was insufficient for an entrepreneur such as Nick who was not satisfied to settle for a life of mediocrity with success hovering over the horizon. With a keen determination he set about to build a firm to meet his ambition and become number one. It was at this point he recognised the need for the right technology to succeed in this industry and installed Autocab which, along with his hard work, proved to be the catalyst for success. Initially ABC Travel were operating on our D21 data terminals and Classic dispatch software. It was a robust system that proved to be reliable and efficient and played a significant part in the expansion of the firm which saw an increase of a hundred vehicles. With data dispatch and GPS they were able to provide a fast and efficient service which would earn them a local award for business of the year. By this point ABC were not only the number one private hire firm in Harlow but also pushing to be one of the biggest and best firms in Essex. If that wasn’t enough, they have recently upgraded their system to Ghost dispatch and Android data heads (Samsung Galaxy XCover). But if business was doing so well, why Change? The future is certainly looking bright for Nick and his team at ABC Travel in Harlow and it appears they are now fully equipped to expand and with around 18k jobs per week and drivers knocking at the door we wouldn’t bet against them. Would you…? Interesting that Nick should mention the benefits of the accounts package in Ghost as ABC Travel recently won an exciting new long term contact at local supermarket giant Asda. This arrangement is mutually beneficial for all parties involved. 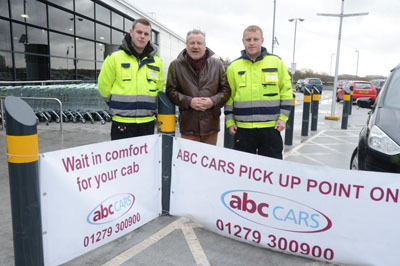 Not only for the development of ABC Travel themselves, but also for their customers using the Asda store. They have a convenient pick-up point located near the exit which is clearly visible to customers. Nick had the ingenious idea of posting marshals between the store exit and the pick-up point. The marshals, professional and courteous, offer to aid the customers with their shopping bags and any other requirements such as wheelchair assistance.